Robinhood Gold works on a tiered pricing system, increasing the cost of gold based on your balance, investments, and desired buying power. 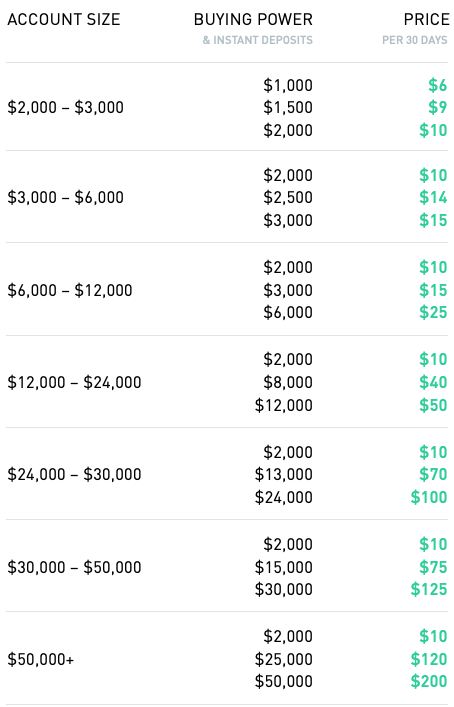 When it comes down to the numbers, Robinhood gold essentially costs 5% APR on whatever buying power you desire with a minimum charge of $10/month on the first $2000. Although a lower tier of $1000 extra buying power at $6/month is listed here, Robinhood currently only offers the $2000 buying power tier. In the future, they may offer a Gold account at $5/month with no increased buying power. Robinhood now has extended trading hours as a standard with the free accounts. The gold account brings (limited) instant deposits and increased buying power. It’s unclear what features the gold account may have if it is being offered with no increased buying power.